A candle rests on a tombstone in a field of graves belonging to WWI soldiers in the main cemetery in Frankfurt, Germany, Nov. 3, 2018. German Chancellor Angela Merkel will mark the 100th anniversary of the end of World War I on French soil, and President Frank-Walter Steinmeier will be in London’s Westminster Abbey. But in Germany, there are no national commemorations planned because the armistice did not bring peace to Germany. German Chancellor Angela Merkel will mark the 100th anniversary of the end of World War I on French soil, and German President Frank-Walter Steinmeier will be in London at a ceremony in Westminster Abby with Queen Elizabeth II. But while the leaders visit the capitals of Germany’s wartime enemies, at home there are no national commemorations planned for the centenary of the Nov. 11 armistice that brought an end to the four-year war that killed more than 2 million of its troops and left 4 million wounded. 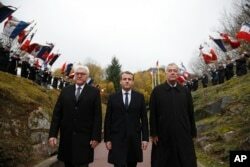 FILE - French President Emmanuel Macron, center, and German President Frank-Walter Steinmeier left, attend a WWI ceremony at the World War I Vieil Armand "Hartmannswillerkopf" battlefield in the Alsace region, eastern France, Nov. 10, 2017. The official at right is unidentified. More than just being on the losing side of the World War I, it’s what came next that is really behind Germany’s lack of commemorative events. “One can’t reduce it to the simple fact that one country won the war and the other lost,” Schoenpflug said. “Germany is a country that draws practically its entire national narrative out of the defeat of 1945” — and not the defeat of 1918. In Germany, even though the end of World War I is now viewed through the prism of Hitler and the Holocaust, in the immediate postwar period there actually was a period of utopianism, with movements promoting idealistic visions of peace and democracy, Schoenpflug said. And as initial euphoria over the end of World War I faded, hopes for the future quickly gave way to feelings of resentment at the reparations and conditions imposed on Germany by the victorious axis powers. The Nazis and right-wing nationalists were able to garner support by propagating the “stab-in-the-back” myth, which held that Germany’s civilian leaders sold out the army by agreeing to the Nov. 11 surrender. And in addition to German officials taking part in the events in London and Paris, the Foreign Ministry said they and their British counterparts have worked together to coordinate the ringing of church and secular bells around the world on Nov. 11 to mark the war’s centenary.